Did you know that pork is one of the most consumed meats in the world? In some way you can compere pork with cigarettes; you can buy it almost everywhere, but it’s damaging your skin and health, little by little. 1) A pig doesn’t have any sweat glands. Sweat glands are a tool the body uses to be rid of toxins. This leaves more toxins in the pig’s body. 2) A pig digests, whatever it eats (everything it can find by the way), very quick. Scientists have founded out that for this reason many of these toxins remain in their system to be stored in their fatty tissues. 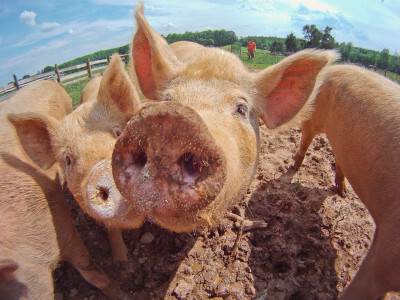 3) Pigs carry a variety of parasites in their bodies. Some of these parasites are difficult to kill even when cooking. 4) Pigs are primary carriers of many viruses, like the Hepatitis E virus (HEV), Nipah virus, the Menangle virus and many more. Now here is the weird thing most people do; they all try to get toxins out of their body. But I ask myself: Why are people so focused getting toxins out, when they can focus on avoiding them, to get in? Eating anything with so many toxins in it will have a negative reflection on your skin. It’s that simple! NOTE: Not only Muslim and Jews don’t eat pork but many other religions (and cultures) at well. Did you know that for instance the Bible, old testament (Leviticus 11) forbids Christians to eat pork? I try to limit the amount of pork in my diet, as I really see them as very “unhealthy” animal to eat. As was pointed out in the article, pigs do really “eat just about anything that is put in front of them”. They will eat slop, feces, etc. They don’t really care what they eat, as long as it is “food”. Do I want to eat this kind of animal? I have to say a resounding “No!”.